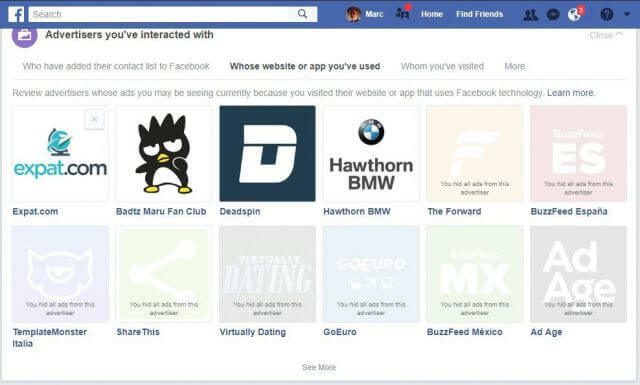 In the wake of the Cambridge Analytica affair, many Facebook users are re-examining their privacy options, many don’t care and most of us haven’t a clue how to tweak the many settings in our Facebook accounts. It’s also fair so say that changing your Facebook settings now may be a case of locking the barn door once the horse has bolted and whatever you do is too little too late– a kind of placebo if you like. On the other hand, many have since deleted their Facebook accounts and given Zuckerberg the finger, but there are measures you can take to at least curb the information that’s used to target you with ads. On the other hand, as Internet privacy today is the plat du jour, your every keystroke on the Net is recorded somewhere and to prevent that from happening you’d need to bolt down your exposure with some pretty extreme measures. For the moment though, head over to your Facebook settings, look at the left column and then click Apps and Websites. 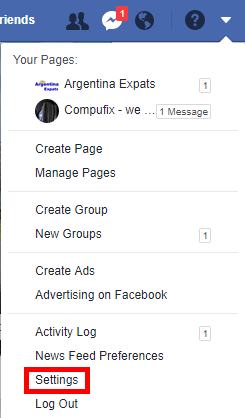 Here you can see the active, expired and removed websites and in my case I had simply added my name to a petition at Change.org through a Facebook page, forgetting that my action would be made public. After you’ve removed the websites (for what it’s worth), hit Ads on the left-hand side. 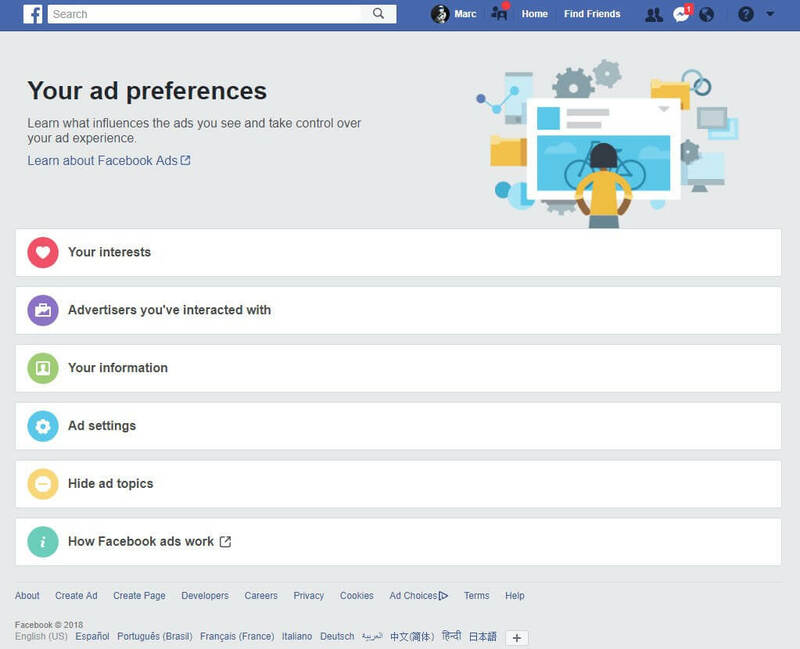 Each one of these sections opens up with a drop-down when you hover your mouse pointer over them, giving you options to turn settings on and off and deleting advertisers you no longer wish to be involved with. I’ve never found the ads on Facebook to be particularly intrusive if I’m honest, but this isn’t about what you see, it’s about what you don’t see. 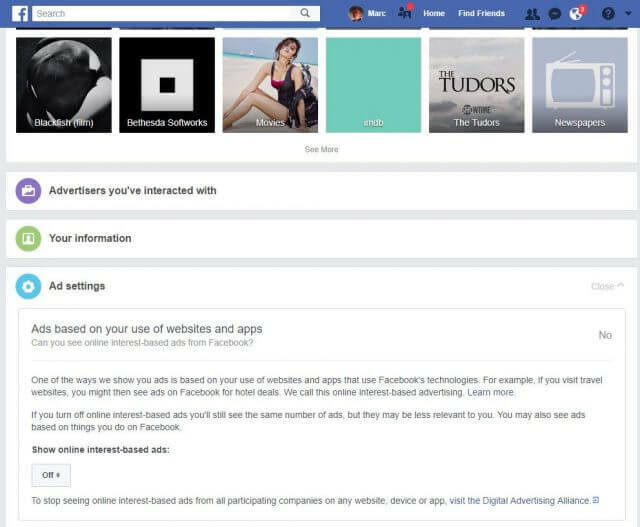 It’s the information about you that Facebook sends to advertisers so they can target the correct audience– your age, likes and dislikes, practically everything you’ve made public about yourself on Facebook. Giving stuff to a giant combine harvester is one way of looking at it. Hover over each ad and a cross will appear allowing you to remove it from the list. Again, I have no recollection of having either seen or visited these ads, I have no interest in BMWs, and I definitely don’t dabble in Virtual Dating so that’s a head-scratcher for starters. Either way, once you’ve removed all the visible ads, you’ll need to click See More and believe me, that list goes on forever and there’s no option to delete all of them in one fell swoop. Then, go through Your Information, Ad Settings and Hide Ad Topics one by one and toggle switches on or off according to your preferences. 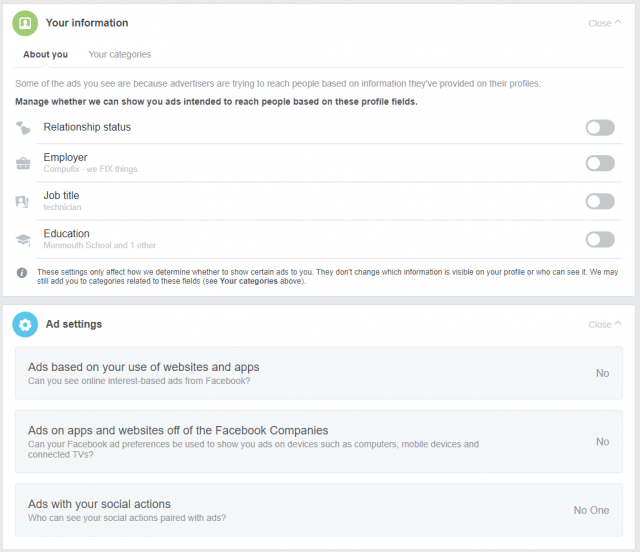 Clearly, these are not settings that you’re going to visit everyday, but from time to time you may find it reassuring to revise them so that you will at least be informed about the kind of information that Facebook is gathering to target ads in your direction. 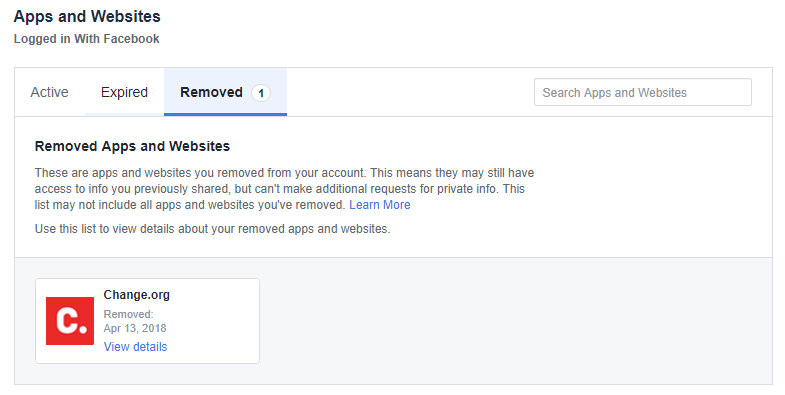 As for what personal data Facebook already holds about you, should you decide to permanently delete your account, it may take up to 90 days for it to be wiped from the Facebook data banks. In the end though, one must accept that posting anything on the Internet will leave a footprint, but it’s worth considering every option to reduce it, if you can. How to make this information sink into certain people’s brains needs a science which has not yet been invented, and the situation with the addition of ‘smart?phones et al are forging greater holes in their security. Many people are security conscious with their homes, alarm systems, locks on windows and doors, even window bars in some extremes, but when it comes to security of their Facebook and other electronic chit-chat one visualises a massive void.